Andy Vores’ opera, No Exit, has returned to Boston after its premiere here in 2008. 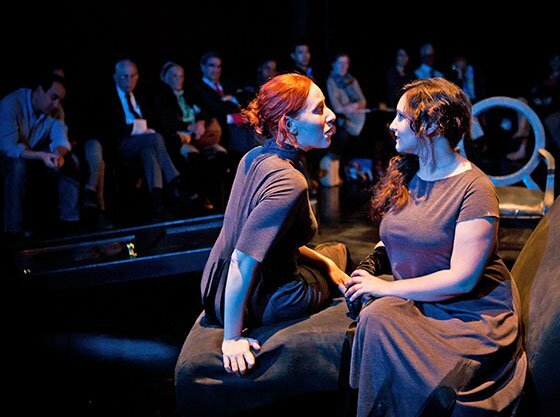 A clever and passionate setting of Sartre’s famous play, it is being presented in Guerilla Opera’s engrossing and intriguing production at Boston Conservatory’s black-box Zack Theater in sold-out shows through Sunday. I attended Thursday’s. Jean-Paul Sartre’s No Exit was a huge success upon its premiere in 1944. A dramatic enactment of the author’s philosophical principals, it shows three people in hell. As they interrogate and provoke one another, the audience sees them lie to themselves and to the others, and watch as they suffer with the need to be perceived by one another. Known best through its usually misunderstood motto “Hell is other people”, at this distance it has an undergraduate aura about it, and the writing’s philosophical underpinnings are obvious and inelegant. Once one has tired of the intellectual justification for the work, you are left with three justifiably damned people, complaining and treating each other poorly. Vores’ libretto sticks very closely with the original; while unable to compare it line-by-line during the performance, it felt like every plot beat I could recall from having read the play made it into the opera, and most of the lines had the same shape. As such, it is not an operatic transformation but more a setting of the text. The composer’s brilliant insight is that the text not only can tolerate being sung, but that the addition of music would give the events on stage a dimension of emotional and theatricality that could put flesh back on the philosophical bones. The opera casts its spell slowly, but once it reaches its stride there is much to admire. The production is presented in the round in the extremely intimate Zack Theater, which appears to hold about 50 or 60 for this production. As the audience seats itself the three new inhabitants of hell, Garcin (tenor Jonas Budris), Inez (mezzo-soprano Christina English) and Estelle (soprano Aliana de la Guardia) are already on stage, as is the entire set – a couch and two chairs, each of which holds one of the actors, and a door. In addition, the Valet (baritone Jonathan Nussman) prowls around the edge of the acting area. The three seated actors suffer almost silently before us as we wait for the production to start. The Valet gives the curtain speech, complete with paradoxical emergency instructions (think about it). Nussman’s Valet has an off-center delivery that combines the sensibilities of a luxury hotel concierge and a Secret Service operative, with a touch of Lurch from the Addams Family. The music of the opera is performed by a small, unorthodox ensemble of saxophone, viola, cello and percussion (Kent O’Doherty, Gabriella Diaz, Nicole Cariglia and Mike Williams, respectively). The opening of the pieces establishes the characters and shows them struggling to come to terms with the strangeness of this hell (no torture devices, no obvious flames) and the awkwardness of their being thrust together. The texture of the opening is thin: individual instrumentalists play rapid passages that reiterate a handful of pitches, supported by the percussion creating an unsettled and static cloud of sound. Through this the vocalists sing lines that are consonant without establishing strong melody. Vores’ vocal writing throughout attends closely to the patterns of speech; significant stretches of this early section almost don’t register as opera, so natural is the delivery. The color of the ensemble and the pitch choices change from character to character, but the opening threatens to stretch into boredom. As the characters begin to explain why they are in hell, initially lying about it though, the diffuse materials begin to resolve themselves, beginning a process that structures the rest of the opera. This first episode is comic, with a hint of Kurt Weill. The characters’ bad faith is made clear by their breaking into speech just as their story threatens to reveal too much. From this point on, the action of the play becomes more broadly emotional, and the material for each new outburst of sentiment is gathered from the pointillistic exposition of the first third. The relative shallowness of Sartre’s characterization turns out to match opera convention well, where a bit of stereotyping helps match voice to character and action. Jonas Budris’ tenor is sensitive and soft-edged, belying Garcin’s bluster and need to appear macho. Much of the overt conflict is between Inez and Estelle—Inez is attracted to Estelle, and also seems to know just how to get under her skin. Estelle’s need to be acknowledged by Garcin infuriates Inez, and leads to a scene that is part seduction, but mostly torture. English’s focused, occasionally severe tone confronts de la Guardia’s warm but powerful soprano. De la Guardia gets the most crowd-pleasing moments in the score—Estelle’s narcissism and preening gives her a shade of diva, and de la Guardia does not let any such moment escape her. However, apart from a few moments where the vocal lines rise to the tops of registers, there is not much display for display’s sake in No Exit. Once the motivations and weaknesses of the characters are laid bare, the piece does lose some forward momentum; this I blame on Sartre. As the characters all evolve into a weakly motivated hysteria, Vores gathers them into dramatic set pieces which keep the emotional temperature high, but lend a tiring sameness to the intensity. One thing lost by the conversion to opera is the sarcastic humor of the original—sung rather than spoken, the lines come off as arch rather than cutting. The nimble stage direction by Nathan Troup, aided by Julia Noulin-Mérat’s black minimalist set kept this 90-minutes-long sung conversation visually exciting. The set pieces were rolled around constantly to present new stage pictures; it did appear that the door may have blocked some parts of the audience during the opening of the piece, but it is soon disposed of creatively. I have never attended a production in the round where I didn’t find myself watching the backs of actors when I wanted to see their faces, but only once did this occur from where I was sitting (on the right side of the stage as you enter the house). Lara de Bruijn’s costumes are in black-grey with black creeping up from the ground—a sign of decay, or perhaps even of flame. Daniel B. Chapman’s vivid and often surprising lighting shaped the emotions of the piece, and provided needed color to a production otherwise overwhelmingly black. But it is the exquisite communication and coordination of the performers that makes No Exit linger. There is no conductor, and the vocalists are often unable to see the ensemble, and yet the singers and the instrumentalists play together. The actors are able to deliver their lines directly to one another, and there is an incredible sense of intimacy, which is only intensified by the smallness of the space; at one point Estelle’s dress dragged over my shoes. I wonder what it was like to be on the other side of the room, where the seduction takes place; it felt quite powerful even from a distance. At an hour and twenty minutes, the opera is just long enough, but that much intimacy is a lot to take, and the claustrophobia took some time to dissipate once I left the theater. The opening-night webcast is online. Watch and judge for yourselves. p.s. – the show starts at about 9:00.